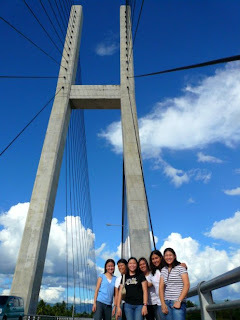 One of the important part of ones travel itinerary when in Butuan should include a stop at the newly built Diosdado Macapagal Bridge or the Butuan Cable Stayed Bridge. Built using Japanese technology in 2007, it is now considered one of the structural marvels of the country today. The bridge consists of a singular tower connected to both banks of the Agusan River by steel spans stabilized by steel cables. This two- lane bridge is also connected to a 13 kilometer roadway that now serve as the new by-pass highway that diverts cargo traffic volume away from the congested Butuan urban center interlinking with the Pan Philippine Highway in the east to that of the Butuan-CDO-Iligan Highway in the west. I'm reading: Bridge Yourself To ButuanTweet this!